Will 2017 Turn Out To Be Another 1982 Bull Market Breakout? 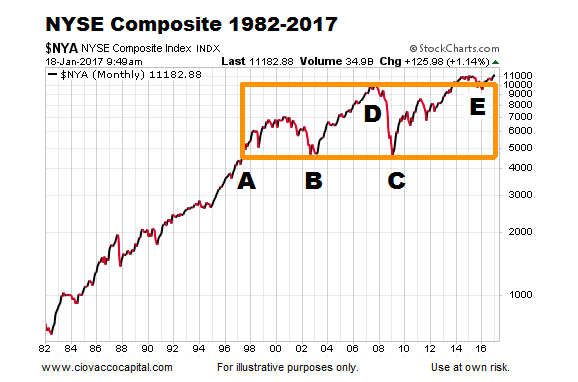 Will 2017 Turn Into Another 1982 Bull Market Breakout? There are several technical occurrences in the present day that are similar to the early 1980s. For example, the S&P 500 broke out of a consolidation box in 1982 by exceeding the high that was made nine years earlier in 1973. In 2013, the S&P 500 exceeded the highs from both 2000 and 2007, which represents a significant long-term breakout for equities. 2016 also represented a very rare “outside year”, an event that last occurred in 1982. The concept of an outside year was covered in detail on December 30. The concept of consolidation followed by a breakout or breakdown applies to all timeframes. 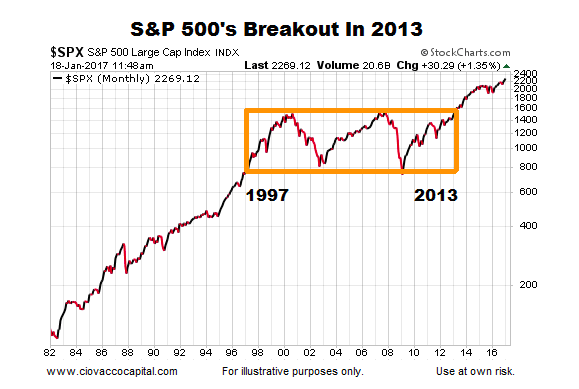 The chart above shows a consolidation box that was in play between 1997 and 2013. A more recent view of the S&P 500 also features a consolidation box that dates back to 2014 on a monthly chart. 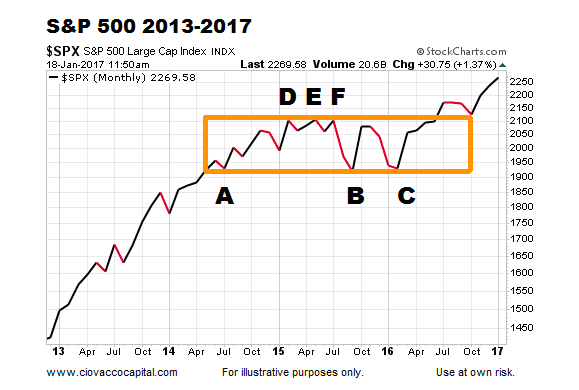 Stocks are currently holding onto a bullish breakout from the 2014-2016 consolidation box. 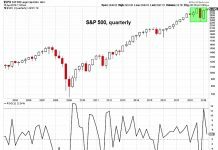 Was this a new secular bull market breakout? How Vulnerable Is The 2017 Market? 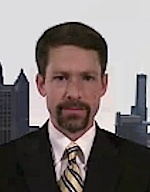 This week’s stock market video looks at the longer-term health of the current rally in stocks. Are longer-term cracks starting to appear? 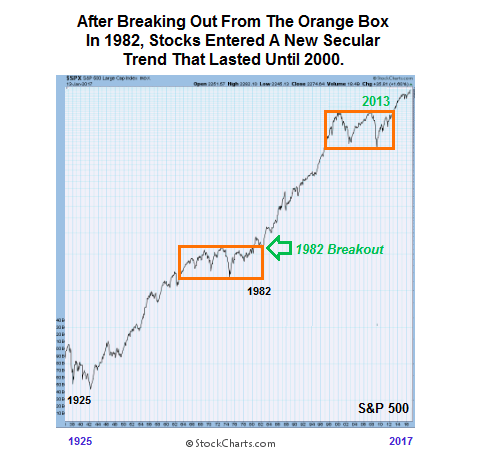 Similar to the multiple-year consolidation that preceded the 1982 breakout in stocks, the present day market also features a consolidation box that started forming back in 1997. As of this writing, the NYSE Composite Stock Index is holding above the orange consolidation box shown below. 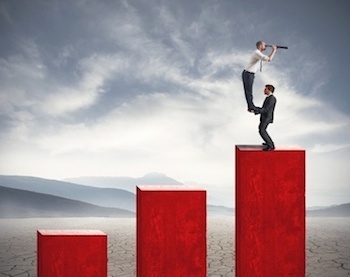 If we double back to the first chart in this article, it is easier to see how the concept of consolidation and breakouts may apply to 2017 and beyond. There were plenty of reasons to be pessimistic in 1982, and yet stocks were able to advance after registering a bull market breakout. Our purpose is not to say 2017 is 1982. In fact, 2017 is a unique year that will be different from every other year in human history. The same can be said for every year; they all follow a different fundamental and technical script. 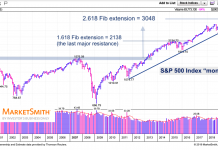 History reminds us that the recent bullish breakouts from long-term stock market consolidation patterns do not necessarily need to be coupled with widespread optimism for stocks to advance over the next several years. Almost no one was expecting an 18-year secular bull run in stocks given the news of the day in 1982, and yet, that is exactly what happened. 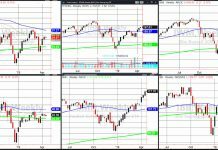 Is it possible for stocks to successfully hold a breakout from a long-term consolidation pattern when the social mood and news of the day have a pessimistic slant? Notice the term “possible” is used above, meaning all bearish scenarios also remain in the realm of possibility. This exercise helps us remain open to all outcomes, not just the pessimistic outcomes often covered in the media. Time will tell. This blog originally appeared over on CCM.